Fylde RFC are bracing themselves for a searching pre-season examination as they welcome Ampthill and District to the Woodlands for their second and final warm-up match this weekend. Admission is free for spectators on Saturday, when the first-team fixture at 4pm will be preceded by a clash of the clubs’ second XVs, the Hawks and the ‘1881’, at 2pm. After winning their opening friendly 48-7 at Kirkby Londsdale last Saturday, Fylde are now looking for a hard hit-out ahead of their National Two North opener at home to Otley on September 1. While Fylde were relegated from National One last season, Ampthill have thrived in their three seasons in the third tier of English rugby. The Bedfordshire club have finished third and fourth (twice) , winning five of their six league games against Fylde, including both last season’s encounters. The youthful Fylde squad can expect to be tested against some very experienced players and a formidable forward pack, which features Ampthill’s awesome Tongan international contingent of Aleki Lutui, Paino Hehea, Maama Molitika and new arrival Soane Tong’uiha, formerly of Northampton Saints. 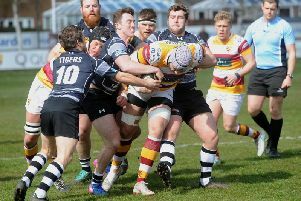 Fylde RFC scored eight tries to brush aside North Premier club Kirkby Lonsdale in Cumbria, when the Second XV run-out had to be abandoned at half-time due to a serious injury to a home player.